Wampum, PA (August 7, 2018) – Taking part in the F4 United States Championship Powered by Honda Official Series Test early last week, the Skip Barber Momentum F4 program and Kent Vaccaro returned to the same Pittsburgh International Race Complex this past weekend for the fourth event weekend of the series. 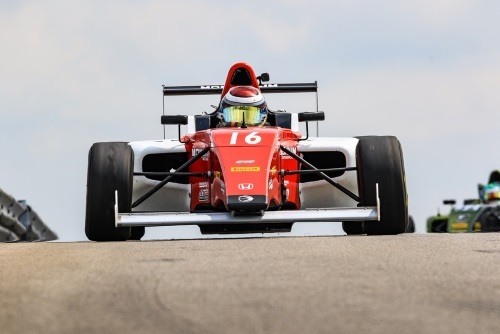 Taking their new found knowledge and putting it to work during official wheel-to-wheel competition, Vaccaro was able to secure his first points of the 2018 season as the Skip Barber liveried car was consistently in the top-ten in speed throughout the event. 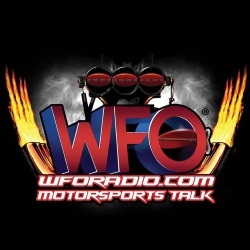 Having his best qualifying run of the season, Kent Vaccaro turned the 11th quickest lap of Saturday morning’s session but would be forced to start race one from the outside of row seven after a penalty classified him in the fourteenth position. Starting the second wheel-to-wheel action from the pit lane, Vaccaro looked to find open and clear racetrack in attempt to lay a quick lap down and better his starting position for race three. With lap times setting the grid order for the upcoming on track event, the Skip Barber Momentum F4 team was not focused on the race result itself, but how fast of a lap they could turn to better their chance in race three. After putting down a decent lap time, the Skip Barber Momentum F4 team decided to pit Kent for a shock change that they knew would improve the car’s performance. While making the change on pit lane, the on track session was slowed due to an incident and Kent was unable to get back on track during green flag competition with enough time for another flyer, forcing him to settle for 11th. Starting the third and final race of the weekend Sunday afternoon, Kent’s times would line him up inside row six and he would go on to have his best result of the season. Showing top-five pace early, Vaccaro gained three positions, all while keeping pace with the lead group and eventually claimed the checkered flag in the eighth position while posting the fifth fastest lap time of the race. 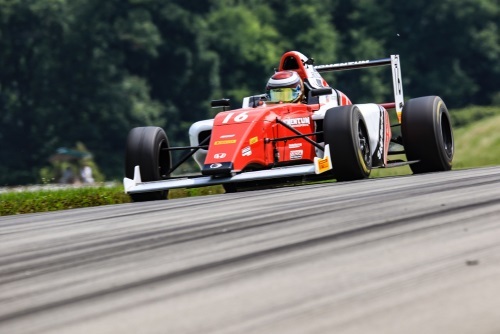 Round 13-15 of the F4 United States Championship Powered by Honda will take place September 14-16 at the Skip Barber Momentum F4 home facility of New Jersey Motorsports Park. Please visit www.F4USChampionship.com for more information.